Selection of great boating accessories, boating essentials, and boating gift ideas. A unique collection of items for your boat. Gifts for the boater in your life. Many products that will make your boating experience that much more enjoyable. Boat Pennants. Boat Pennant String is 120 feet in length with 100 pennants per string. Pennant Size: 9 inches wide x 12 inches tall. Pennants are made of 4 GA virgin polyethylene, double sewn on, hi-strength, sag-resistant NABLON®. Many Color Choices. Small custom embroidered boat mat. Mat is 17 inches wide by 12 inches tall. Can be personalized with your choice of font, color and/or personal message. Boat mats are made durable marine grade carpet that's mold, corrosion and UV resistant. Large custom embroidered boat mat. Mat is 30 inches wide by 21 inches tall. Boat Mats can be personalized with your choice of font, color and/or personal message. Boat mats are made durable marine grade carpet. Perfect gift idea for boaters. Perfect mat for your boat, dock, or home! Mat is 33 inches wide by 17 inches tall. Semi circle boat mats are made durable marine grade carpet that's mold, corrosion and UV resistant. Personalized boat mats with your information. 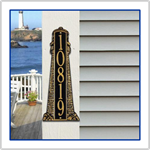 The Lighthouse Welcome mat is a great way to welcome guests to your home or dock with a classic nautical look. Two colors available. Makes a great house or boat warming gift. Durable marine carpet with rubber backing. Must have for any boat owner. The Please Remove Shoes Welcome mat is a great way to welcome guests to your home or dock. Available in two colors. Marine grade carpet is UV resistant, mold resistant, and corrosion proof. A Must have for any boat owner! Welcome Aboard nautical mat. A great way to welcome guests to your home or dock. Available in two colors. The marine grade carpet is UV resistant, mold resistant, and corrosion proof. Show off your boat to guests with a stylish carpet mat. American Stars and Stripes Boat Pennant Flags. Available in two material options: Economical 4 Gauge Polyethylene or Long Lasting Supreme Cloth. American Flag Stars and Stripes Boat pennants are 60 feet long stings, flags measure 12'' wide by 18'' tall. Americana Boat Pennant Strings. Two material options: Economical 4 Mil Polyethylene or Heavy Duty 8 Mil Polyethylene. Patriotic Boat pennants are 60 feet with 24 stars and stripes flags per string. Flags measure 12'' wide by 18'' tall triangles. Americana Boat Pennant Strings. Available in two material options: Economical 4 Mil Polyethylene or Heavy Duty 8 Mil Polyethylene. Americana Boat pennants are 60 feet long stings with 24 flags per string. Flags measure 12'' wide by 18'' tall triangles. Patriotic Boat Fan Dangles come two-sided. They are very bold and bright and quite attractive. 60 foot long pennant strings with 20 fans per string. Red, White, and Blue boat fans that ''say'' America. Perfect for hanging on your dock. Show your pride! Red, White, and Blue Boat Pennant Strings - stylized American Flag. The Yankee Doodle Boat Pennant String is 60 feet long with 32 pennants per string. Decorate your boat, dock, or house with festive pennant strings for the holidays.